That changed on this day, with a studio performance of new single Paperback Writer. The Beatles had agreed two days previously, when manager Brian Epstein passed on a request from Top Of The Pops producer Johnnie Stewart. Unusually, on this occasion The Beatles agreed. The live broadcast took place between 7.30pm and 8pm on BBC One. The Beatles were the final act to appear, and mimed to both Paperback Writer and its b-side, Rain. They were introduced by host Pete Murray. 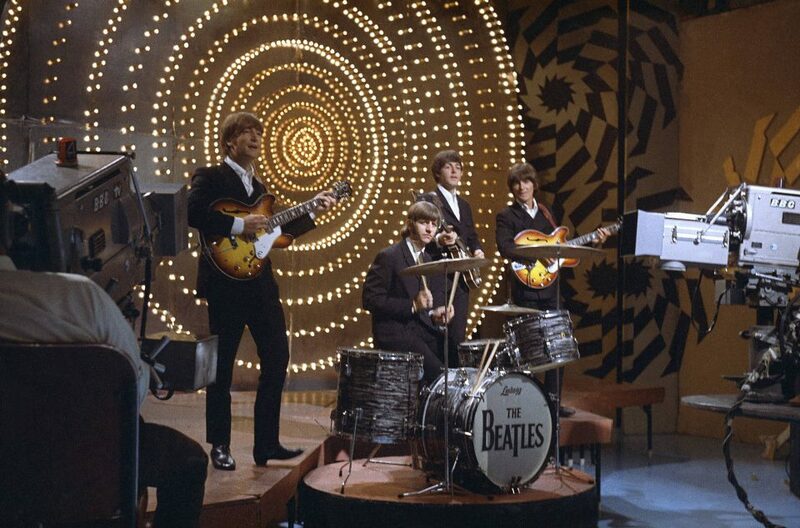 The Beatles' only appearance on Top Of The Pops was, with the exception of the worldwide satellite transmission of All You Need Is Love on 25 June 1967, their final live television appearance as a group. I own the BBC camerman’s running order script for the TOTPs transmission. I’ll shortly put a scanned copy onto the internet. Hi Marcus. Please let me know the link when the scan is ready. I’d like to include it on the site if I may. Is there any video of this? Is it true that the BBC wiped the tape? They didn’t appear live on the programme. It was recorded at Twickenham with Frost doing an introduction, so that it could be used on his show.